British vocalist and musician born 23 March 1968 in Whitechapel, London. The family moved to Leytonstone, London not long after he was born and then to Colchester, Essex. 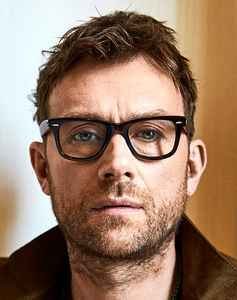 Best known as a founding member and vocalist in British rock band Blur in the mid-1990s. Later formed Gorillaz in 1998 as a side-project with old housemate Jamie Hewlett, and would provide the singing vocals for fictitious lead singer 2D (3). Damon also used this alias outside of Gorillaz on a handful of occasions (see credits). Incredibly prolific, respected and busy musician releasing and collaborating with artists from all over the world since 2000. Was once engaged to Justine Frischmann, Blur's album "13" is supposedly written about their breakup. Once acted in a British gangster film called "Face", alongside actors Ray Winstone and Robert Carlyle, also voiced George Harrison's character "Bull" in a radio play "Up Against It" by Joe Orton. 'X-Offender', Damon's Control Freak remix of 'Bugman', is proof that Albarn's no longer just an indie pretty-boy. This mix strips away the loud guitars of the original and replaces it with low-key hip-hop stylings. 'Sunset Coming On', meanwhile, is an odd, ambient, world music arrangement. An incredibly interesting musician who pushes back the boundaries of the pop and indie scenes, I recommend Damon Albarn to anyone looking for something different to listen to. You'd be surprised.